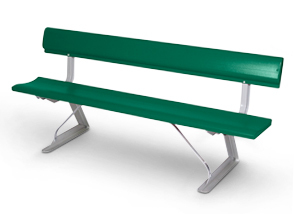 The specially designed contoured seat and backrest make this bench not only extremely comfortable, but a low cost lightweight alternative to traditional benches. The frame is made of extruded aluminum with a silver anodized finish. The seat and backrest are powder-coated in the colors shown below.